Our Hamilton Capital U.S. Mid-Cap Financials ETF (USD) rose 15% in its first year, outperforming the U.S. large-cap financials index (S5FINL Index). The sheer earnings growth of HFMU.U holdings supported this outperformance despite two very formidable obstacles, both of which we believe are unlikely to recur. Of importance, HFMU.U achieved this outperformance with significantly lower drawdowns and volatility. What were these obstacles? First, multiple expansion for the 4 mega-cap banks – which represent ~40% of the benchmark – supported the performance of the U.S. large-cap financials index in the past 12 months. Even though these mega banks continue to grow EPS at a much slower rate than their mid-cap peers, they benefited from multiple expansion primarily as the market became more optimistic on U.S. economic growth (of which mega-caps are de facto proxies). Multiple expansion of these 4 mega-caps provided a substantial tailwind to returns as average P/E’s rose from 9.6x to 10.3x (and P/BVs multiples rose from 1.2x to 1.4x)1From September 1st, 2017 to August 31st, 2018. Second, U.S. mid-cap banks (~70% of HFMU.U) have more exposure to commercial lending and are therefore more rate sensitive than their large-cap peers, which have more exposure to slower growth capital markets/investment banking. 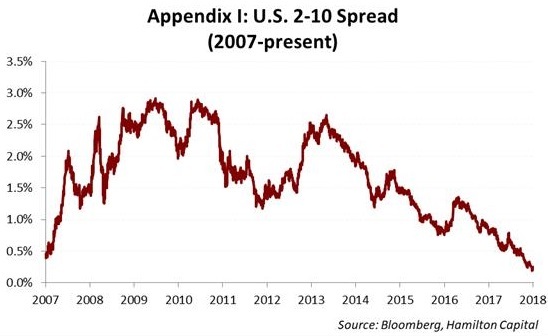 However, one crude/largely outdated macro-indicator that holds great sway over generalist investors is the 2-10 spread, which in the last year compressed to its lowest level in over 10 years at 23 bps, falling from 79 bps a year ago (see Appendix I). This spread is seen by many generalist investors as a proxy for the yield curve, and therefore when it compresses creates concerns over margin compression. However, as the (material) EPS growth of HFMU.U has highlighted this past year, the decline in this spread did not have a material impact on earnings2See ETF Commentary for comments on HFMU.U, including EPS growth. However, it influences large pools of fast-moving capital, which weighed on P/E multiples. So, despite transient factors supporting large-caps financials and one significant – but outdated – sentiment indicator weighing on mid-caps, HFMU.U still managed to outperform its large-cap peers, while experiencing materially lower volatility. For example, the XLF – or large-cap financials index – declined for 5 consecutive months ending in June 2018. Going forward, consensus portfolio-weighted EPS growth for 2019 for HFMU.U is ~13.1% with a P/E of 12.0x. This compares very favourably to the large-caps, which have portfolio-weighted consensus EPS growth of ~9.6% and a higher P/E of 13.4x. In addition, we continue to believe that the Hamilton Capital U.S. Mid-Cap Financials ETF (USD) provides exposure to a huge and attractive part of the global financial sector, possessing the following positive attributes: (i) customized geographic exposure to higher growth states/regions, (ii) greater rate sensitivity, (iii) favourable regulatory tailwind, and (iv) ongoing consolidation. 1 From September 1st, 2017 to August 31st, 2018. 2 See ETF Commentary for comments on HFMU.U, including EPS growth.